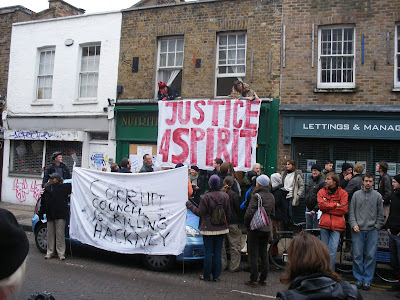 Bailiffs abandoned plans to take possession of Spirit's home and shop today after a rally of local people gathered on Broadway Market to show their support for one of the street's best loved characters.The eviction was due to take place at 9:20am but, after discussions with police, the bailiffs left . Spirit's supporters are now expecting them to rearrange the appointment to collect the keys for another time.
" Although there is still an enduring determination in me to continue my fight for justice, it has become aware to me that my physical and financial strength will no longer allow me to actively participate in this final act of defiance to keep my beloved property. From the time I acquired this property back in 1993, it has been a long, hard struggle. The first six years were extremely difficult, mostly physically, building this home of mine. The succeeding seven years, I was subjected to what amounts to all of the experiences that life could ever confront a human being with. At times I have felt completely discriminated against, robbed of my self-worth and dignity and feel as though I am being whipped! 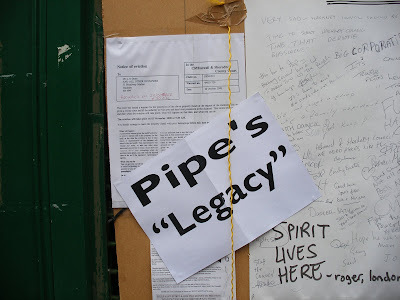 I would like to let you all know that if it was not for the support and strength of the people like yourselves, who have actually given me the determination to physically last until now, particularly the people of Hackney, especially the people of the Broadway Market community who I know are the true defenders of humanity. To you all I give much thanks. We have tried to keep my home and my shop, however corrupted forces have prevailed by way of taking it from us for now. My situation at this moment in time is that I have no home and my possessions are scattered all over the city but I still have life and where there is life there is hope. I am very sorry that I am not able to be with you today in person to join in this last act of defiance against this eviction. I feel that this is just too much emotionally for me to witness. I am continually thankful for the support during this distressing time but I ask that your support should only be of peace, love and unity and not to be of any form of violence or intimidation toward the authority…. "the same tongue that says no, is the same tongue that says yes!" "A man that fights and runs away at most times he will live to fight another day"
I am still fighting the Battle of Broadway along with your continual and much needed support and together we can show the whole of London that we care about our communities and each other and it is what makes us unique and real. Jules Pipe is Mayor of Hackney and leader of the local Labour Party. The Council's policies gave rise to a £70million budget deficit in 2001 which led to the auctioning of its assets to avoid bankruptcy and government intervention. The Council's Standing Orders required it to give its tenants first option to purchase their properties before offering them for sale elsewhere. Although its decision to auction was made in July, Spirit was not informed or invited to purchase until 28 days before the auction in December 2001.